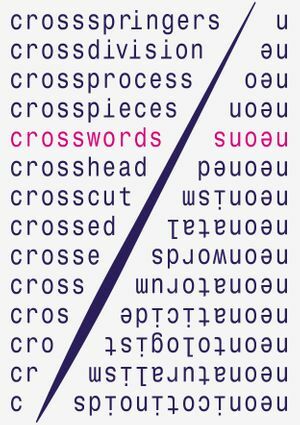 The third CROSSWORDS exhibition begins anew the surprising game between language and art, explored previously by Jordan/Seydoux and LAGE EGAL. Words and letters get mixed up, joined again in poetry and playfully brought into new contexts. The exhibition displays an overview of positions from the early 1970s to the newest artistic practices. After all, words have always been there for us. However, it's not just the texts, but also the audience which is set in motion here. The exhibition occurs simultaneously in two locations: JORDAN/SEYDOUX in Mitte and LAGE EGAL in Prenzlauer Berg, producing a rare collaboration between a gallery and an off-space. Two poles of a creative dialogue, rich in allusions, humor, irony and passion for the printed word. And between them, a space for further conversations is opened. JORDAN/SEYDOUX starts first in November with a salon hang presenting drawings and paintings together with limited editions or multiples and photographies, LAGE EGAL waits the darkest month of the year and shows in December a selection of light and neon works.